Roberta Joan "Joni" Mitchell, CC (née Anderson; born November 7, 1943) is a Canadian singer-songwriter and painter. 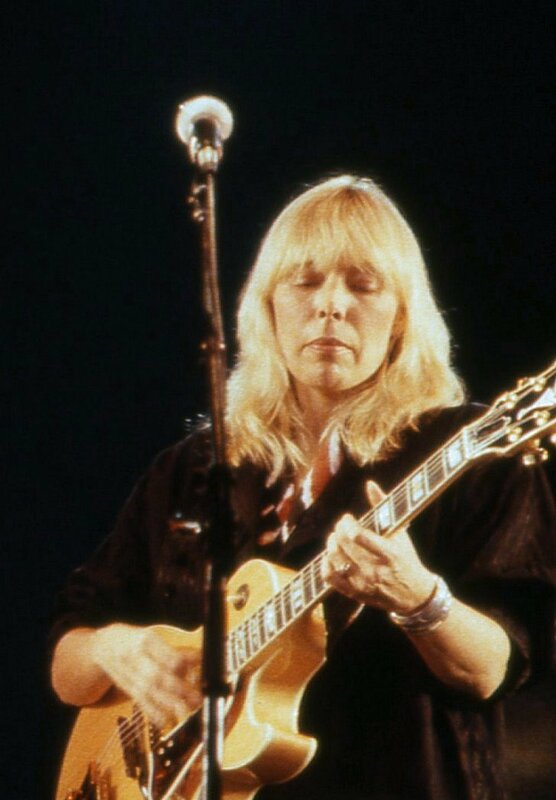 Rolling Stone called her "one of the greatest songwriters ever", and AllMusic has stated, "When the dust settles, Joni Mitchell may stand as the most important and influential female recording artist of the late 20th century". Drawing from folk, pop, rock, and jazz, Mitchell’s songs often reflect social and environmental ideals as well as her feelings about romance, confusion, disillusionment, and joy. Throughout her career, she has won various accolades, including 9 Grammy Awards. Mitchell began singing in small nightclubs in her hometown of Saskatoon, Saskatchewan, and throughout western Canada, before busking in the streets and nightclubs of Toronto. In 1965, she moved to the United States and began touring. Some of her original songs ("Urge for Going", "Chelsea Morning", "Both Sides, Now", "The Circle Game") were covered by other folk singers, allowing her to sign with Reprise Records and record her debut album in 1968. Settling in Southern California, Mitchell, with popular songs like "Big Yellow Taxi" and "Woodstock", helped define an era and a generation. Her 1971 album Blue is often cited as one of the best albums of all time; it was rated the 30th best album ever made in Rolling Stone’s list of the "500 Greatest Albums of All Time", the highest entry by a female artist. In 2000, the New York Times chose Blue as one of the 25 albums that represented "turning points and pinnacles in 20th-century popular music". In 2017, NPR ranked Blue Number 1 on a list of Greatest Albums Made By Women. Following the release of her fifth album, For the Roses, in 1972, Mitchell switched labels and began moving toward jazz rhythms by way of lush pop textures on 1974’s Court and Spark, her best-selling LP, featuring the radio hits "Help Me" and "Free Man in Paris". Around 1975 her vocal range began to shift from mezzo-soprano to more of a wide-ranging contralto. Her distinctive piano and open-tuned guitar compositions also grew more harmonically and rhythmically complex as she explored jazz, melding it with influences of rock and roll, R&B, classical music, and non-western beats. In the late 1970s, she began working closely with noted jazz musicians, among them Jaco Pastorius, Wayne Shorter, Herbie Hancock, Pat Metheny, and Charles Mingus, who asked her to collaborate on his final recordings. She later turned again toward pop, embraced electronic music, and engaged in political protest. In 2002, she was awarded a Lifetime Achievement Award at the 54th annual Grammy Awards.